The Friends of A Dales High Way are leading a walk on Friday, 3rd May as part of the 2019 Ride2Stride Walking Festival. All are welcome. The 9-mile circular walk starts at Settle Railway Station at 10.22 a.m., meeting the train from Leeds, and will be led by Chris Grogan. Crags, Caves and Kilns is described as "an excellent walk from Settle visiting Attermire Scar and returning via the Hoffman kiln. " The walk takes in sections of A Dales High Way and is described as "moderate", but walkers can expect some steep climbs, especially in the first part of the walk. Chris said "This is a stunning walk with some fantastic views and lots to look at along the way. It's a long steep climb from Settle to Victoria Cave but we think it's worth it and there will be plenty of short stops for walkers to take a breather on the way." The walks are free, just turn up for the start on the station platform. There are 30 led walks in this years programme, with music at various venues along the line every evening. See the Ride2Stride website here. 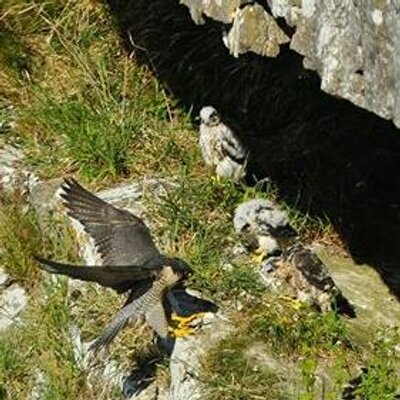 See up-to-date news at the Nature in the Dales Facebook page here. Next week marks 50 years since the very first public walk along a section of our big sister trail - The Dales Way. The popular riverside trail was the inspiration for it's tougher younger sister - A Dales High Way! See the Dales Way Association website here. The route that most Dales High Way walkers follow out of Skipton climbs steeply up Park Hill and quickly offers great views back over Skipton Castle and forwards to the distinctive peak of Sharp Haw. There is another way though, an alternative route below the castle walls and up through Skipton Woods where walkers are greeted by a huge willow sculpture. 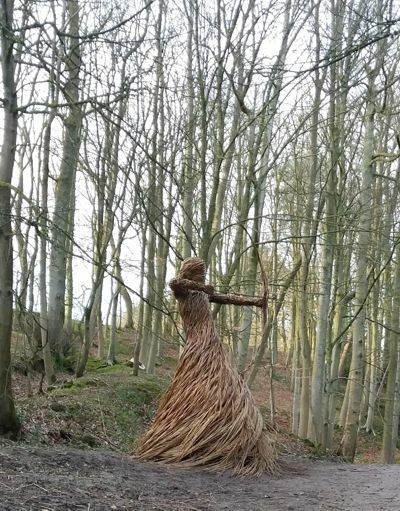 Skipton Woods are an ancient woodland and the sculpture, ‘Spirit of the Medieval Hunter’ with her bow and arrow, reflects their past as the hunting and fishing grounds for Skipton Castle. She was created last year by Anna and the Willow, a talented artist from Ripon. Deeper in the woods is a willow pony. Anna said "Ive been blown away by all the amazing feedback and really pleased the sculptures sit so well in the ancient woodland." The woods are cared for by the Woodland Trust, and their permissive trails make a great alternative escape from Skipton. Follow the Sougha Gill track to make your way up and rejoin A Dales High Way by the A65 for Tarn Moor. 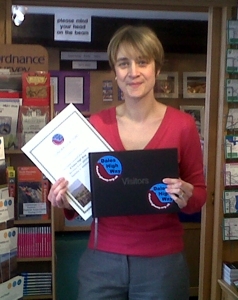 See Anna and the Willow's work here, the Woodland Trust here, and see the Skipton Alternative Routes here. 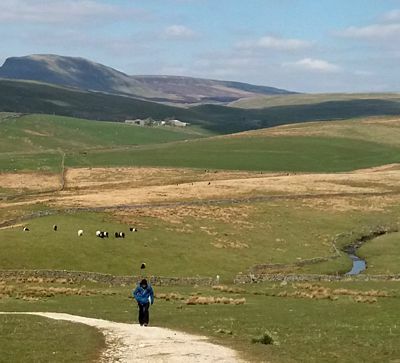 An increasing number of walkers tackling A Dales High Way are taking in all of the Yorkshire Three Peaks along the route - Pen-y-ghent, Ingleborough and Whernside. The official Dales High Way route includes only one of the Three Peaks - Ingleborough - but offers Whernside as an option. However, Pen-y-ghent does not feature. It is possible, though, to include Pen-y-ghent in Section Three, which runs from Settle to Chapel-le-Dale. The suggested Pen-y-ghent - Three Peaks Alternative adds 4 miles, with an additional 300 metres of ascent, taking around 2 hours extra. However, it also gives the opportunity to break the Section at Horton-in-Ribblesdale. Typical of this group of walkers is Ian, who flew up from the Channel Islands last summer to walk the trail and has just posted a blog about his adventures. "It is a tweaked version of the DHW, missing out the first few miles and instead starting at Ilkley, but aiming to include all of the Yorkshire 3 peaks. That's the plan anyway" he said. The Pen-y-ghent - Three Peaks Alternative cuts from the main Dales High Way route at Stainforth Bridge, heading up through Stainforth to join the Ribble Way, climbing to Moor Head Lane and continuing north along the ridge to join the Pennine Way. It then follows the Pennine Way up to the summit of Pen-y-ghent and down to Horton-in-Ribblesdale, before heading for Ingleborough to rejoin A Dales High Way above Crummackdale. Did Ian have a good time? "What a walk it has been. I am a relative novice when it comes to long distance walks but this must be up there as one of the best trails in England. Many have highlights but also some ‘by the numbers’ sections, but here every day had something special, a unique feature, an achievement, an icon" he said. "The 3 peaks formed the main event, but the appetizer was the Malham area and the dessert the Howgill Fells. That’s a sumptuous 3 courses!" See Ian's blog here, and see the Pen-y-ghent option here. "Promoted through a superbly illustrated Companion booklet, rich in local geology, history and wildlife, with detailed OS-based maps in an excellent Route Guide, the Dales High Way is a sure-fire winner for all keen Dales walkers." 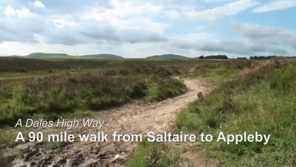 Dales High Way - the film! 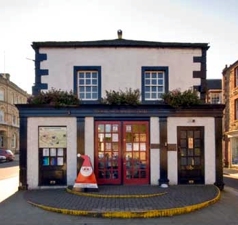 Don't forget to call in at the Appleby Tourist Information Centre when you finish your walk to sign the Guestbook and collect your Certificate. Celebrate your Dales High Way walk with this beautiful high quality enamel lapel badge.